Zero SG launched today a “groundbreaking” data plan that promises 1GB of 4G data for $1 per day. Called Data One, the plan is an add-on to the basic Go Zero Mobile Plan, which has been reduced from $45 a month to $40. This move could be seen as a strategy to up its game against rival Circles.Life, which offers 20GB of data for $20. 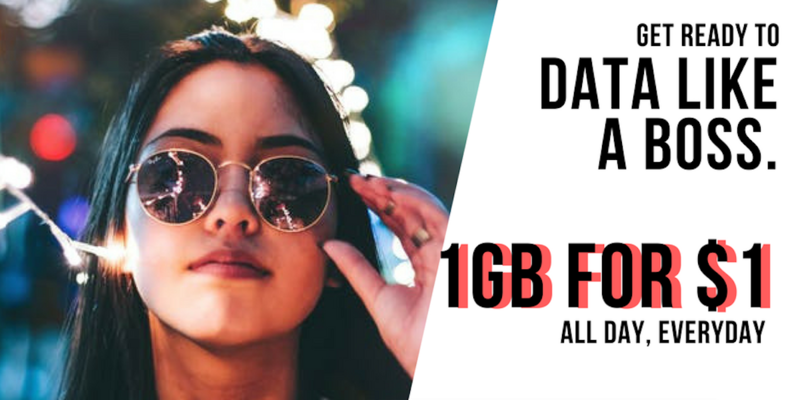 This whittles down to also 1GB of data for just $1 – but the difference between the two is that Circles’ data plan is valid for monthly usage, while Zero SG’s is a daily plan. “The introduction of Data One gives our subscribers more flexibility with almost unrestricted usage at a price point lower than a cup of coffee,” said CEO Glenn Mohammed. He added that Zero SG has received an “overwhelming response” since their soft launch in December last year. Zero SG is currently open for registration to new subscribers until February 28 for delivery in early March. A new virtual mobile telco called Zero Mobile, which is headquartered in Australia, will be launching in Singapore by this month. Singapore is its first overseas market, making it the second virtual mobile telco here after Circles.Life. Virtual telcos do not build their own physical mobile networks, but leases them wholesale from one of the existing telcos. Zero Mobile’s partner is Singtel, while Circles.Life works with M1. For a foreign telco that is breaking into a new market, it is rather peculiar that it is charging new subscribers a “joining fee” of $18. However, Zero Mobile claims that this fee is the “lowest in the market” and that other providers charge between $38 and $63 for one-time sign-up fees. Also, since the pricing plan is usually the deal breaker to get customers to subscribe, it is also interesting to note that its base plan is higher than local telcos’. The cheapest base plan in Singapore is currently Singtel’s $20 plan with 3GB data and free incoming calls. For Zero Mobile, it charges $45 a month for 6GB of data and unlimited local calls. Beyond this, Zero Mobile also offers data add-ons at 1GB for $10, 3GB for $20, and 6GB for $30. But the most compelling proposition of all is that is lets subscribers lower their bill costs if they refer Zero Mobile to others. Customers can get a recurring credit of $9 per month for every person they refer to the service, capped at five. With 5 active referred customers, a Zero Mobile subscriber can effectively enjoy free mobile services. However, if someone discontinues the service, people who referred them will stop receiving the credits. Circles.Life also has a referral programme in place, but it offers additional mobile data as a reward. It also charges $28 a month for a similar plan, and offers a data add-on of 20GB for $20. “We have modelled our business in a manner where revenue derived directly from the subscriber is not our primary source of revenue,” said Daniel Waters, Zero Mobile’s chief operating officer, to The Straits Times. After the first three months, Zero Mobile will offer other promotions that allow users to drive down their bills to zero. Further clarifying their business model in a media statement, CEO of Zero Mobile Glenn Mohammed, said that it chose to forego spending millions on marketing to get new subscribers. Instead, it wants to give “more value” to their subscribers by offering them options to reduce their monthly expenditure on mobile phones. More information on this will be furnished once they’ve concluded their beta stage in March 2018. He also emphasised that all the reward programmes are optional. “Any subscriber can simply choose to turn these features off at any time, and continue to pay for their service,” he added. Zero Mobile will start activating its service around Christmas for up to 5,000 subscribers. However, it is still unsure as to how many more customers it can activate every month thereafter. In the future, Zero Mobile will also have to compete with broadband provider MyRepublic, which has received a virtual mobile telco license from the Infocomm Media Development Authority. It is expected to offer services early next year. Zero Mobile has four employees in Singapore now, but plans to hire another 20 over the next six weeks to fill software development, operations, marketing and sales positions. It has also hired about 20 people in its Australian outfit, which was founded 14 months ago. Sign-ups for Zero Mobile are currently closed, but you can register your interest here.